Planning a vacation, business or property buying trip? Then you'll want to know what the Dominican Republic weather is going to be like. Well, you are in the right place because this is our guide to weather in the DR.
Daydreaming about the sunshine you will soon be basking in, when you arrive at your Dominican vacation resort, is always an enjoyable part of of the build up to enjoying your Caribbean holiday. Despite hearing about how great the Dominican weather normally is, it is typical to worry about whether or not it will be a "let-down" when you experience the reality! It's always good to have the added reassurance that you've chosen a 'good time' to book your holiday! Sometimes the weather in the Dominican Republic does create unexpected conditions. Just take a glance at our supplementary page: Freak Weather: Dominican Republic for some amazing images. Not often that you'll see such scenes anywhere in the DR... but once in a while it can occur. If you have not been on a vacation in the Dominican Republic before, then we are glad to be able to tell you the 'good news' about the weather in this wonderful Caribbean country. To a large extent it is pretty much consistenly good throughout the year! Even though we are used to it - its is hard for those who are born in the DR not to think of the Dominican Republic weather as just about perfect!! But then I suppose we are bound to be a bit biased. The Dominican Republic is indeed a tropical paradise as far as the Caribbean weather goes. For it is true to say that the Dominican Republic weather is mostly warm and almost always sunny throughout the whole twelve months of the year. ...However! If you have not yet committed to a particular date for your Dominican vacation, or settled on your choice of Dominican Republic resort, then there are some things that you may want to consider. In fact it wasn't until my sister Esther, and I, sat down and began to reminisce about our own recollections of the Dominican weather, and to try to decide what I should write about the weather patterns in the Dominican Republic, that we realized how complex it could be trying to explain easily and quickly, how the climate varies across Santo Domingo (the country -- as we Dominican often refer to it -- not just the capital!) throughout the year! Rest of the year will be added soon...Please call back! This is where it starts to get a bit confusing! A season when it rains (sometimes heavily, but cheer up, it is rarely for long! And it's often during the night!) and although it is occasionally cloudy the sun still shines most of the time - the so called 'Wet' season. The confusing bit about this is that the Dominican Republic weather pattern varies throughout the year depending on WHERE you are visiting at any time of year. The amount of rainfall, and when it occurs, can also vary depending on location. So you might just want to think about WHERE to head for depending on WHEN you plan your visit! 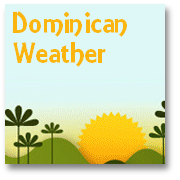 Dominican Republic weather - How does it vary between the major holiday areas and resorts? Now its going to be helpful to have a map of the Island to refer to, I think, and so I include a small one below. 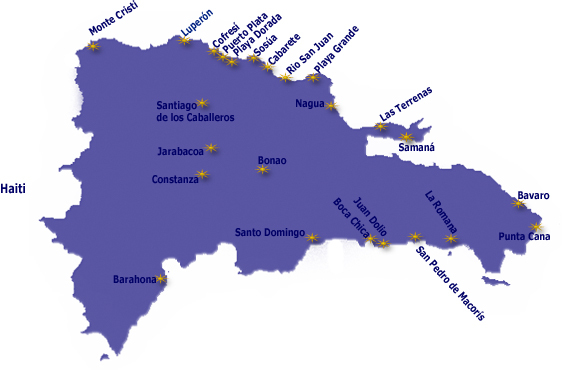 But if you want a good map, to help you plan your vacation effectively, you can get a good Dominican Republic map here. Broadly speaking the Northern coast of the Dominican Republic - let's say somewhere like the wonderful City of Puerto Plata, or the nearby beaches of lovely Sosua, or lively Cabarete - experience a wetter period during the 'autumn/winter' months of October through January. 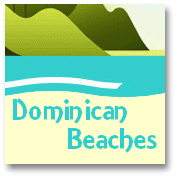 The Dominican Republic weather is then splendidly sunny in these Northern areas of the Island during the summer months, June to September. You can find more information about Puerto Plata city here, and for beaches of 'the Silver Coast' ('Plata' means 'Silver'...as you probably know) on our 'Best Beaches' page! The pattern of the Dominican Republic weather begins to change as you move in an Easterly direction! From the picturesque peninsula where you will find lovely Las Terrenas and the stunning Samana Peninsula and on around the Eastern tip of the Dominican Republic, between beautiful Bavaro and pretty Punta Cana, there is a wonderful warm dry period from late December through to March. Conversely the North-East and Eastern area tends to have more rain any time from June through to November. Although, as we mentioned, these showers may be heavy they rarely last for long periods and are usually followed by glorious sunshine…so a quick downpour can be a blessed relief for more than just the plant-life! As you move on round the coast to La Romana on the South-East coast - and inland toward the 'town of artists', and rich man's 'peccadillo' Altos de Chavon, the driest period also lasts from December to March. Here the Dominican Republic weather begins to confuse the unwary again as there is a 'wetter' period during May. It is then dry and sunny again during the summer months. But in September/October the rains return again. Overall, though, this area tends to experience a lower annual rainfall than other parts of the country. As you head Westwards along the Southern coast toward the thriving capital city of Santo Domingo the driest season remains December through March. The wetter period lasts from May through October. From the City of Barahona, along the less 'touristy' coast and inland to the National Parks there are two distinct dry periods. The first of these falls, once again, between January and March. The second dry period between July and August is sandwiched between what can be equally fiercely wet spells peaking in May and October. Even as far inland as the country's second largest City, Santiago - which is just a little North West of center - the weather in the Dominican Republic tends to be dry from January through March and from June through August. You can guess by now that you might reconsider a visit to the Santiago area if you want to miss the rains, which can be quite heavy in May, then return again from late September through November. I suppose that those of you who understand the impact of geography on weather patterns will be able to explain it better that I can, but no doubt the fact that the Island of Hispaniola is host to some of the highest peaks in the Caribbean probably plays its part in influencing the wet and dry seasons! As you travel to the more 'elevated' townships on the slopes of the Cordillera Central, the temperature can drop considerably, especially at night! One of the most attractive inland towns, I think, is charming Jarabacoa. Surrounded by pine forests, the area this lovely Town is set in is also home to many coffee plantations...and consequently also home to many wealthy Dominicans. These fortunate locals also appreciate the cooler fresher climate, away from the stifling humidity that characterizes the resorts nearer the coast. If you should choose to venture higher still into the to the Town of Constanza night-time temperature can often fall to freezing. It may not be the Dominican Republic weather alone that seems unusual here for many Japanese settlers adopted both this area and Jarabacoa as their new home around two generations ago after the they were encouraged them to relocate back in the Trujillo era. How to avoid the worst aspects of the Dominican Republic weather! Well, I promised to tell you how to avoid the worst aspects of the Dominican Republic weather. Even though the weather is nearly ideal for much of the year there are a couple of things you might want to consider in deciding when to visit. 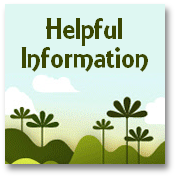 As with all Caribbean countries and parts of the Americas there is periodically the chance of hurricanes visiting the Island. Really serious storm damage has only happened on a couple of occasions in the last decade. Technically the hurricane season spans from June through to November. However, as a rule of thumb the period when cyclones are most likely to occur is in mid-September through mid-November. For much of the country this is also when the Dominican Republic weather is wetter! So my general advice would be to avoid these months for a more settled and enjoyable time! 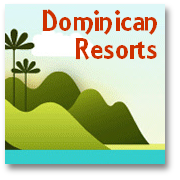 However as it is these times that some great deals can be found for Dominican vacations (now you know why!) it may well be you find yourself making a visit during this time. I should also add that personally, I wouldn't choose to visit in August! The humidity can be very high so it feels very hot and sticky. Storms may be a little less likely than September through November, but I just think August weather can be overwhelming for us Dominicans, let alone unseasoned visitors! But then again 'some like it hot!' so maybe for you this is just when you'd like to be here getting that golden tan?! Just as a closing thought for this section on the weather in the Dominican Republic I thought I would tell you about my personal favorite time of year. As a child I grew up in San Francisco de Macoris, a characterful town not so far from the country's second City, Santiago. I was also lucky to spend long periods at my Grandparents home in a rural parts of the Tamboril area (a municipal region of Santiago)called Licey al Medio (El Cruce). Back then the House was set in a typical traditional Cafetal (coffee plantation) and the ripening coffee bushes were shaded by many and various fruit trees including the Dominican favorite - avocado! Tobacco was also the other main cash crop grow there. It was such a special time and Esther, my brothers and I still have many happy memories of earning our first 'pay-packet' picking coffee beans for our Grandfather. to Grab a Great Free Spanish Course to 'get you ready' for the DR! It has to between January and March. In my hometown area the weather is dry and warm and not too humid during these months. I think that for most visitors it is the perfect time to come, and being the the 'off-season' for holiday bookings you can get some 'bargain fares' too. For visitors another bonus, if visiting between mid-January and mid-March is that it is the 'whale watching' season - the time when thousands of hump-back and other whales, and dolphin visit the Bahia de Samana, to bask and mate. A visit with an eco-aware company to see this natural phenomenon is an event you will never forget! YOu might also remember though, that if you are traveling inland at Easter time to see how the locals live, the Towns are likely to be deserted as we all go the wonderful Dominican Republic beaches for a few days and celebrate Easter in the Dominican surf! So What's The Dominican Weather Like Right NOW? Why not check the weather in the Dominican resort you are thinking of visiting? Just type in the place name (e.g. Puerto Plata) in the space specified above for an instant report and forecast in our Dominican Republic weather window! 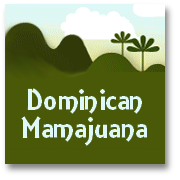 And if our Dominican Republic weather page has helped you plan your Dominican vacation more effectively, please do consider making a small donation HERE - to help ensure the continued viability and growth of www.visiting-the-dominican-republic.com, which is an entirely voluntary project. May we recommend you visit our Bookstore & vacation requisites shop where there you can browse a full range of Dominican Republic travel guides, maps and books and a whole lot more?